Nigeria’s Technical Adviser Gernot Rohr and some of his technical assistants on Sunday landed in the Federal Capital, Abuja as preparations kicked off for next week’s 2018 FIFA World Cup qualifying match against Zambia in Ndola. 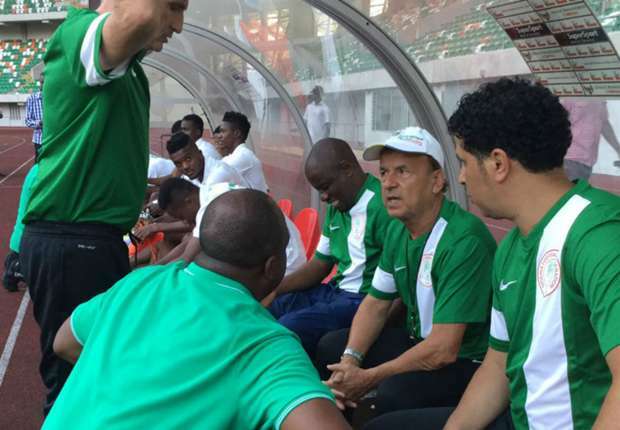 France–based Rohr, who has now been provided with accommodation in Abuja by the Nigeria Football Federation, jetted into town aboard an Air France flight in company with technical assistant Jean Luc Royer and video analyst Nabil Trabelsi. The team’s backroom staff were early birds at the team’s Bolton White Hotel and Apartments in Abuja, with Chief Coach Salisu Yusuf expected on Sunday evening and assistant Coach Imama Amapakabo expected on Monday, after he would have picked up Nigeria’s elite League trophy as histable -topping Enugu Rangers hosted El-Kanemi Warriors on the final day of the season on Sunday. Meanwhile, Captain Mikel John Obi has debunked reports of his being injured, saying he is fully fit and ready for Sunday’s cracker at the Levy Nwanawasa Stadium against the Chipolopolo. “I don’t know where the story about my being injured came from. I have no injury. All the other players and myself are fit and ready and we are determined to start the World Cup race on a winning note,” Mikel told the team’s Administrator, Dayo Enebi Achor on Saturday. Players are expected in camp as from Monday with training sessions scheduled for morning and evening each day before departure to Ndola by chartered flight on Friday.